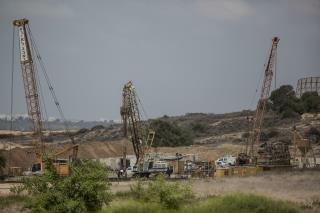 (Newser) – A senior Israeli military official on Sunday said a massive underground barrier being built along the Gaza border to defend against Hamas tunnels should be finished in a matter of months, dealing what he said would be a serious blow to Hamas, reports the AP. The Southern Command official said the structure was at the forefront of a new effort meant to rob Hamas of one of its most potent weapons. During a 2014 war, Hamas militants on several occasions made their way into Israel through a tunnel network, though they did not manage to reach civilian areas. Israel destroyed 32 tunnels during that conflict, and since then has made neutralizing the tunnel threat a top priority. If Israel wanted to get rid of Hamas, they should stop stealing Palestinian land and calling it Israel. Killing Palestinians with American taxpayer dollars is not helping either. So all Americans should be looking at this underground wall and know they are paying for it, while the roads and bridges in their own town are falling apart and they have nothing to say about it, because the American congress is in the pocket of AIPAC, that association of Jewish American businesspeople who takes from the USA to give to Israel. None of this is right and it has to stop. I'm not smart, so correct me when I am wrong. Israel has and has had a embargo on Palestine for a long time. No need to build a deep wall, just hire out of work politicians and have them fill the tunnels with gas.